Casting Real People “Non-Actors” for “Game of Thrones vs Lord of the Rings” Who have real knowledge of the series in your opinion as to why “their” series is the best in New York! CASTING REAL PEOPLE IN NEW YORK – please share with your non-actor friends! Shoots May 14, paying $300 for a 6 hour day, for a video that will run on YouTube. 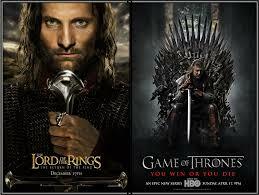 Looking for real Game of Thrones fans and Lord of the Rings fans. Should be beyond the casual viewer, and have a real knowledge of the series and mythology, with a direct, passionate, and thought out opinion as to why “their” series is the best. Could be a super fan, with memorabilia, who attends Comicon, or someone who may not be so overt, but has their heads wrapped around the events and details of the series, and won’t pass up getting into a heated debate about it. Ideally would prefer for people who are fans of one series over the other. Please email reality@lizlewis.com and send your name, phone, email, a picture of you, and tell us what series you are a fan of, why you consider yourself a “superfan” of the series, and why its better than the other series. We will be holding interviews in-person and via Skype next week!